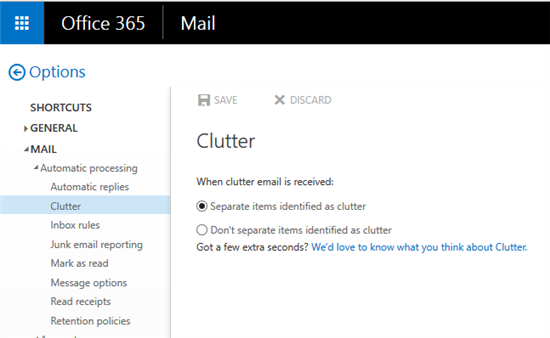 Yesterday I got another email, again introducing the clutter feature, this time telling me it was already enabled. Sure enough, the clutter folder had reappeared and some emails were in it. I followed the instructions to go to the options screen (https://outlook.office365.com/owa/#path=/options/clutter) to disable it, but found that the feature is already set to disabled. Anyone know how I can actually turn it off? Update: You may also want to enable it first and then disable again if it is disabled already. Connect to Exchange Online using PowerShell. However, end users can also enable it by themselves, so administrators cannot prevent them from using it. I will pass your requests on to our relevant team. At the same time, I suggest you submit your advice to our feedback team. Customers’ feedback will help better our products and services. I hope the Clutter can be controlled completely by administrator in the future. Not the answer you're looking for? Browse other questions tagged email microsoft-outlook exchange office365 or ask your own question. How do I find out if a printer is scan to email compatible with Office 365?